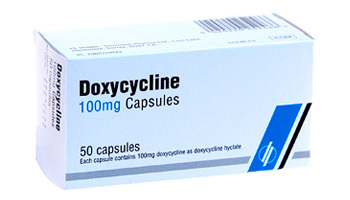 Doxycycline is a generic form of a tetracycline antibiotic medication. It is marketed under several brand names such as Oracea, Adoxa, Atridox and Vibramycin. Each medication contains the same active ingredient (Doxycycline), but the concentration, preparation and inactive ingredients may vary. Vibramycin comes in tablet, liquid or capsule form and the dosage varies depending on the severity and type of the infection. Oracea is a 40mg extended release capsule that is taken once daily for the treatment of rosacea blemishes. Adoxa is available in tablet form in 50mg, 75mg, 100mg and 150mg dosages. Atridox is a 10 percent doxycycline injectable solution that dentists use to treat gum disease in adults. It is not available for standard prescription and must be administered in-office. Vibramycin and Adoxa are used to treat a wide variety of bacterial infections, including bladder infections and some sexually transmitted diseases. These medications can be used to prevent malaria, prevent or treat anthrax infections, or relieve acne in some very severe cases. Oracea is a short-term treatment for blemishes caused by rosacea, but it does not reduce all of the associated redness. Atridox is an injectable doxycycline solution that is administered in a dentist or oral surgeon’s office in order to treat severe dental infections like gingivitis and other periodontal diseases. All of these medications contain the active ingredient doxycycline and carry much of the same risks and side effects.